Top Ten Tuesday is a weekly meme hosted by The Broke and the Bookish where we list our top tens! This week’s topic is a rewind, so I picked “top ten words/topics that instantly make me buy or pick up a book.” I feel like some of the words/topics that I’m instantly drawn to fall into the same category. Whoops? I tried to explain why I’m instantly drawn to these words/topics but I didn’t know how to convey the reasons why I love it. Probably because it’s things and such that I haven’t encountered for myself. I live vicariously through the books. What words are on your list? I love reading books about reincarnation and spies. There should be more books about those! 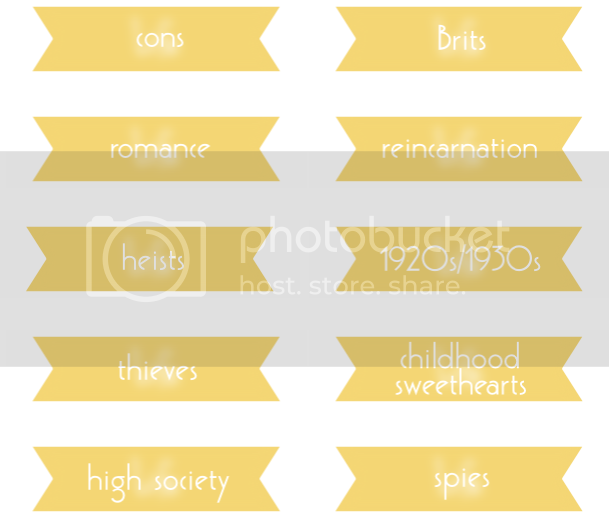 So basically, you like British mysteries set in the 1920s that feature childhood sweethearts? That’s okay, I LIKE THOSE TOO!!! LOL. But yeah, I totally also love all of these things, especially childhood sweethearts. I know it doesn’t happen THAT much in reality, but it’s nice to think about.